More than your average group, the performance experience becomes a blend of the ancient and futuristic. Tevellus has been constructing a fusion of styles including Middle Eastern, Indian, Funk, Jam, and Jazz - blending up drum Layers from all traditions into a construct of unique, fiery music. Accompanied by the dance of the captivating Ms Fury, Tevellus takes the audience on a journey of exploration into soundscapes of the worlds cultures and brings them into new spirit. 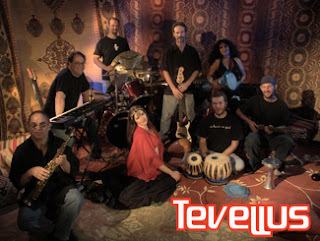 Originally formed in 2005 as an acoustic guitar and electronic percussion duo, Tevellus has grown to a full-size troupe, including baglama saz, tabla, sitar, drums, electric guitar, bass, cello, keyboard, various percussion and guest reed and string players. The Tevellus debut was released in 2009, "Blue Star" the bands second album releases spring 2011- both on the band's own Sign 11 label. The “Celebrate Providence!” Neighborhood Performing Arts Series is presented and sponsored by the City of Providence, Angel Taveras, Mayor, the Department of Art, Culture + Tourism, and the Department of Parks & Recreation. Healthy snacks and beverages from our featured sponsor, Whole Foods University Heights will be available for a small donation. The Food Truck from RISD, Rosie’s will be curbside at all of our concerts this year. Two New Fitness Classes Starting Today!